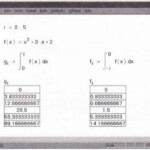 In the placeholder to the left of the equal sign, type a variable name. 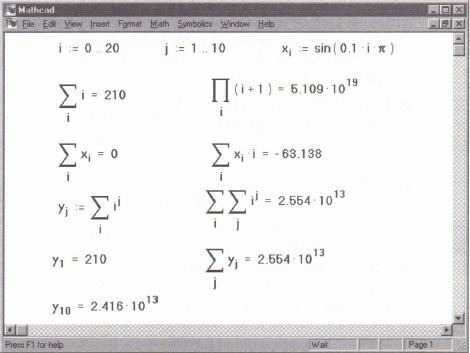 This variable is the index of summation. It is defined only within the summation operator and L- _ therefore has no effect on, and is not influenced by, variable definitions outside the summation operator. • In the remaining placeholder, type the pression you want to sum. Usually, this expression will involve the index of a pair of parentheses around the placeholder. 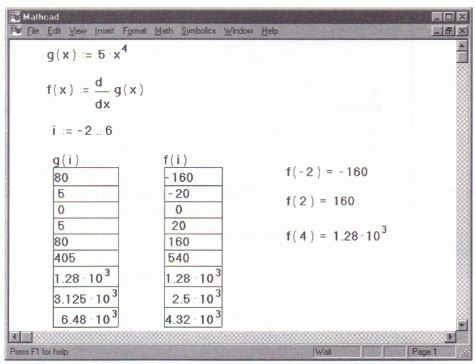 Figure 12-1 shows some examples of how to use the summation and product operators. You can use a summation or an iterated product just as you would any other expression. 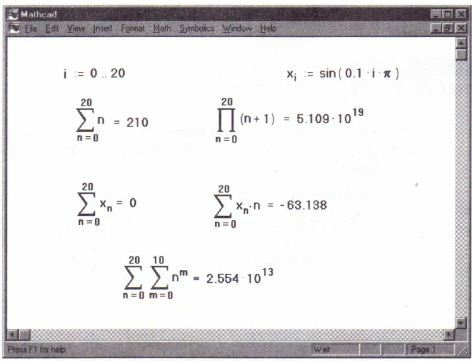 Figure 12-2 shows some examples of how to apply the range sum and range product operators. These operators, unlike the summation and product operators created with [Ctrl][Shift]4 and [Ctrl][Shift]3, cannot stand alone. They require the existence of a range variable. 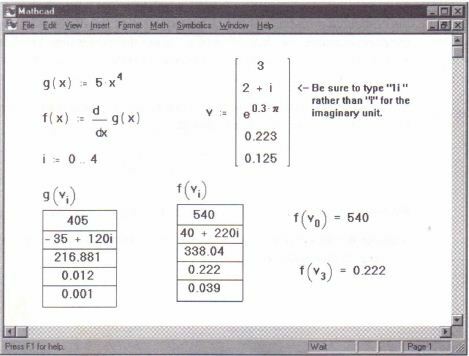 Note however, that a single range variable can be used with any number of these operators. You can use summations and iterated products just as you would any other expression. 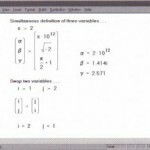 To evaluate multiple summations, use two range variables as shown in Figure 12-2. 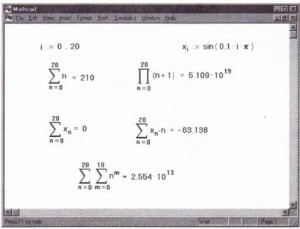 Range sums and range products. 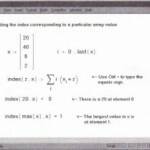 Mathcad’s range summation operator runs through each value of the range variable you place in the bottom placeholder. It is possible, by judicious use of boolean expressions, to sum only up to a particular value. In Figure 12-3, the term i ~ x returns the value 1 whenever it is true and 0 whenever it is false. 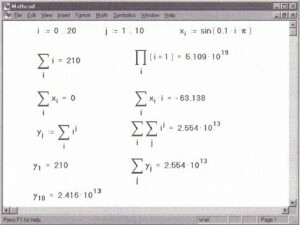 Although the summation operator still sums over each value of the index of summation, those terms for which i > x are multiplied by 0 and hence do not contribute to the summation. • Click in blank space or on a placeholder. Then press [Ctrl]4. 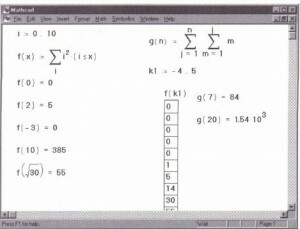 Evaluatingfix) will retum the numerically computed derivative of g(x) at .x . 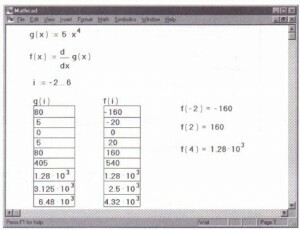 You can use this technique to evaluate the derivative of a function at many points. 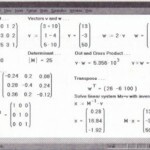 An example of this is shown in Figure 12-5. 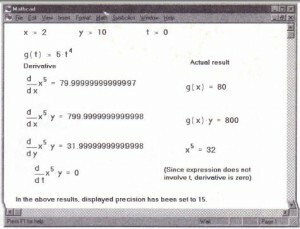 Evaluating the derivative of a function at several values stored as elements of a vector. • The expression to be differentiated can be either real or complex. 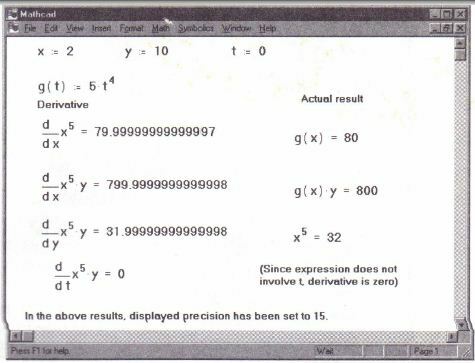 Mathcad has an additional derivative operator for evaluating the nth order derivative of a function at a particular point. 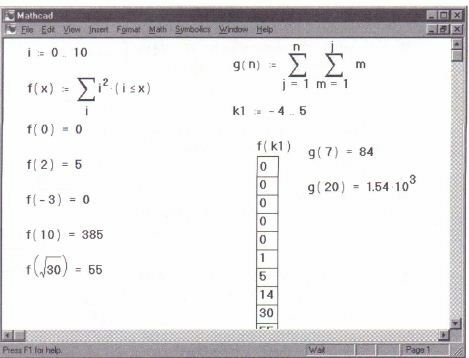 For n = 1, this operator gives the same answer as the first-derivative operator discussed above. For n = 0, it simply returns the value of the function itself.